The reason we have called these our bodywear pages and not clothing is because like our masks and accessories the following items are formed and made of molded leather. 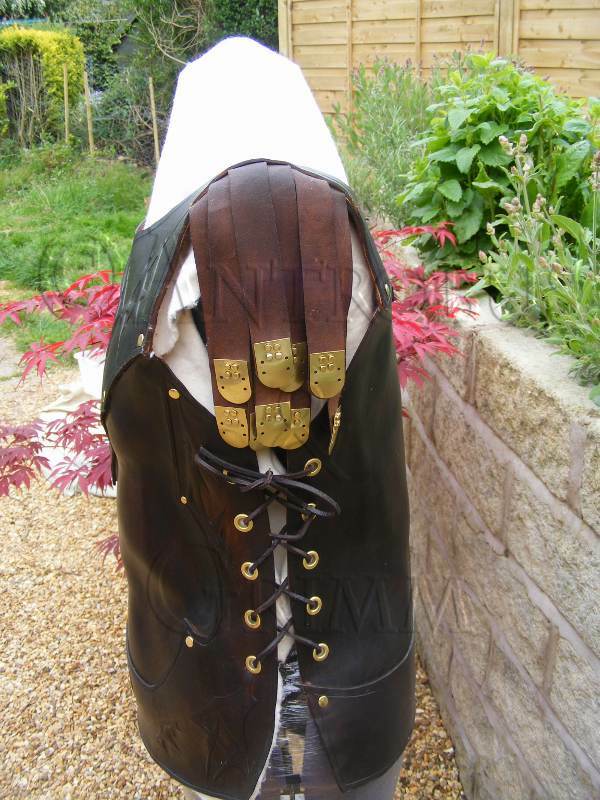 Unusual and original, these items are a cross between armour, art and clothing. Most of the work we do in this area is commission based, all of the items below are one of a kind, if you are interested in commisioning a piece please contact us with your ideas and requirements. Please use the links below to browse through our bodywear pages. This is one of our latest commissions! 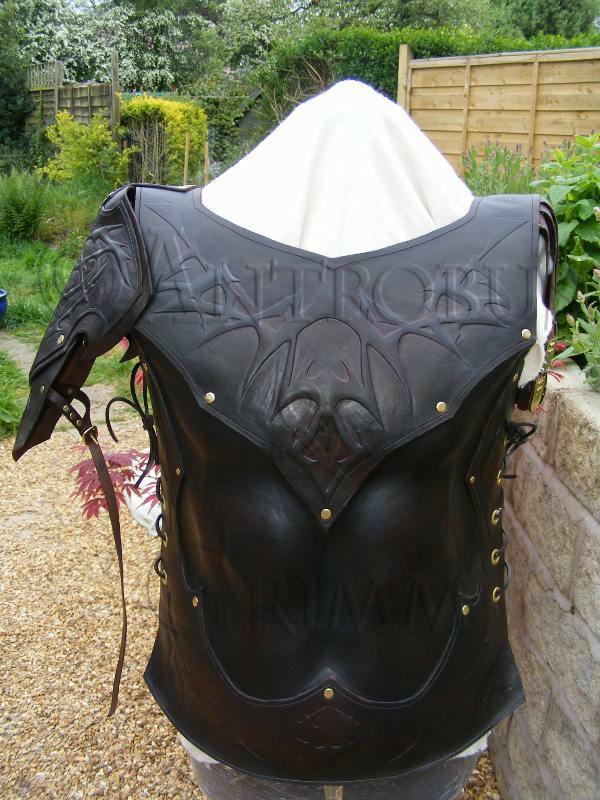 The front and back of the armour was moulded to fit our client. 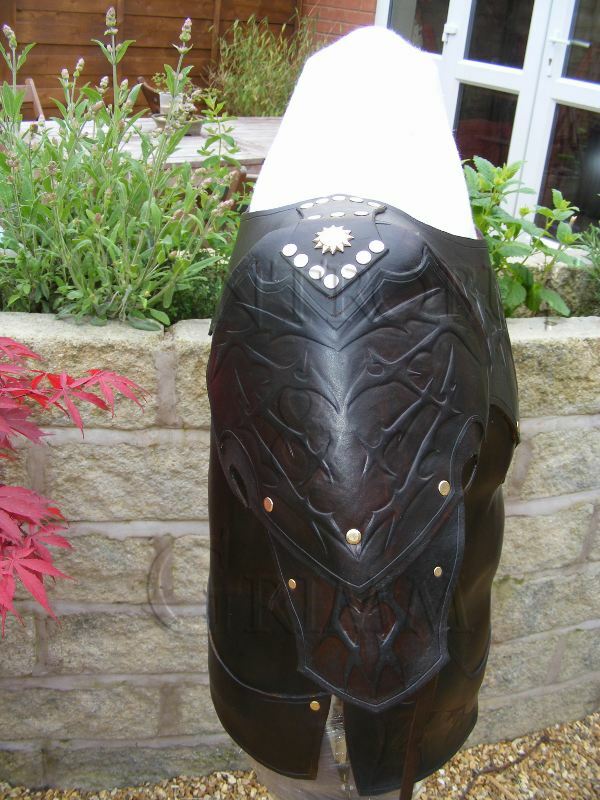 Once the initial piece had been completed a second layer of carved patterned leather was added around the shoulder and neck area and further sections were added to the bottom edge of the armour. 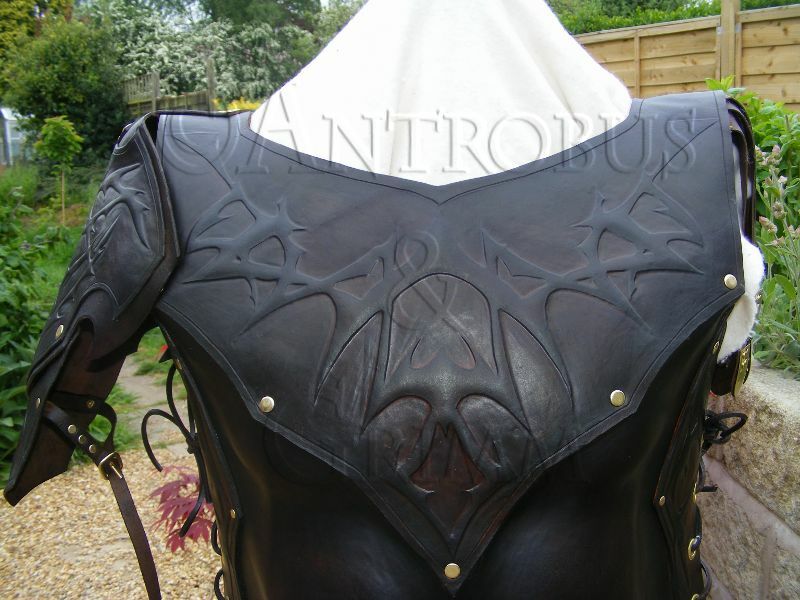 A closer look at the carved detail on the armour clearly shows the amount of care and attention that goes into all of the creations from A & G. The patterning was designed specifically for this commission to meet the requirements of the client. 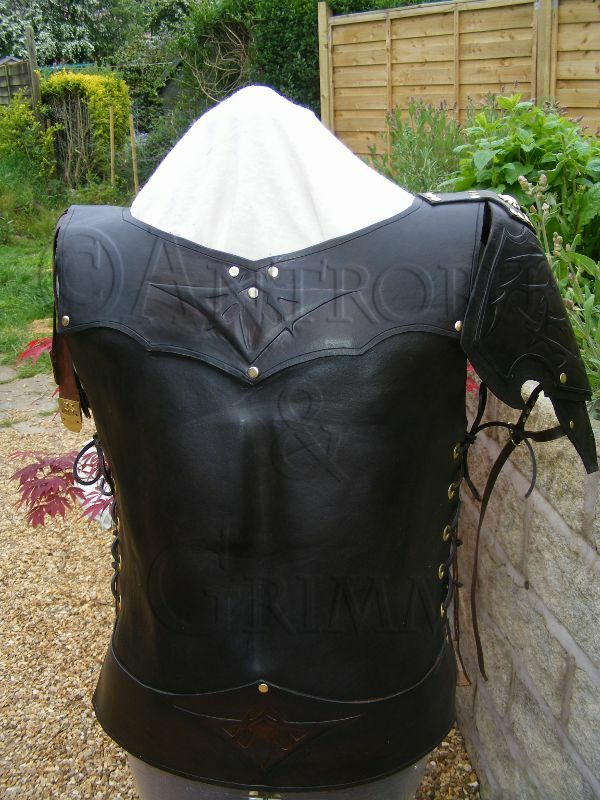 The left hand side of the armour was designed to incorporate a shoulderpad or spaulder. The pad was cut from two pieces of leather to allow greater movement of the arm when worn. 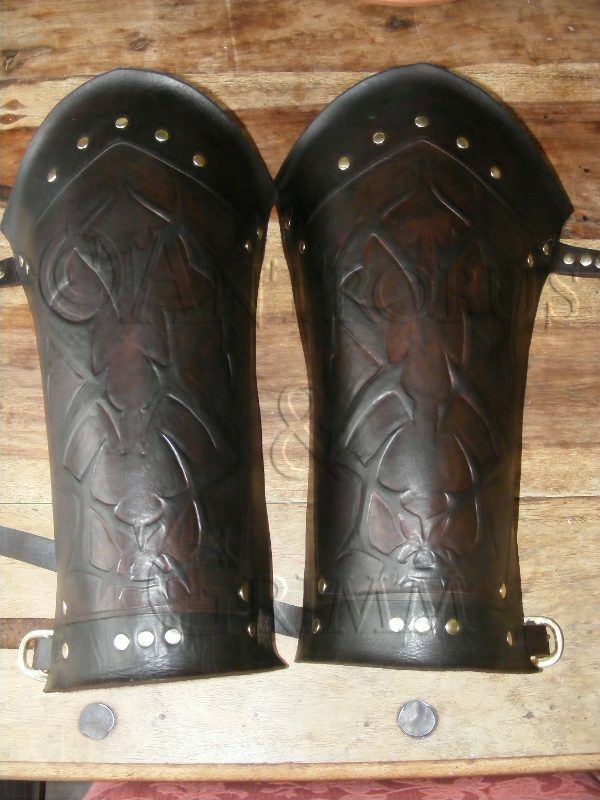 A second layer of leather was added to the initial construction to provide greater protection to the arm and to allow further decorative carving. In contrast to the left; the right side of the armour was designed to allow far greater flexibility for the sword arm. 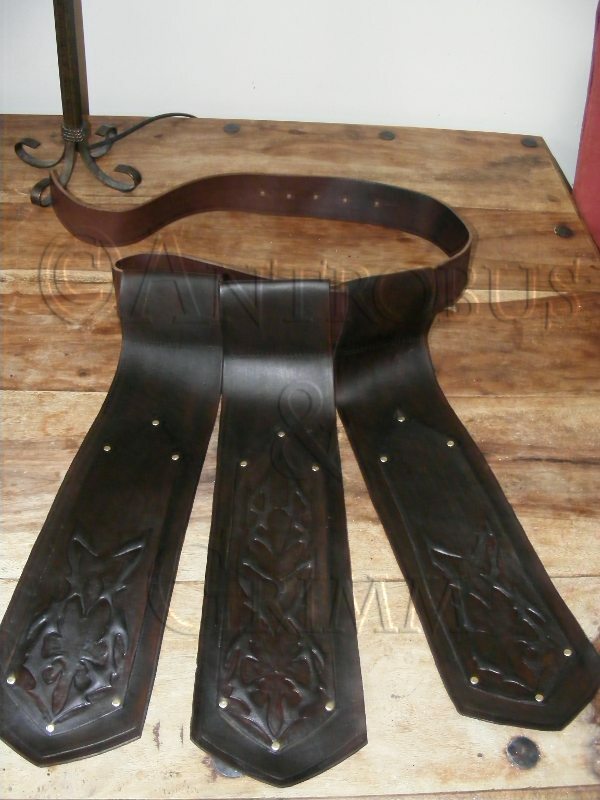 In place of the spaulder hang leather strips tipped in metal plates. To complete the protection of the main body a set of paturages were created to hang from a belt below the main body of the armour. Each of the three sections has a hand carved panel in the same style to continue the attractive uniformity of the piece. 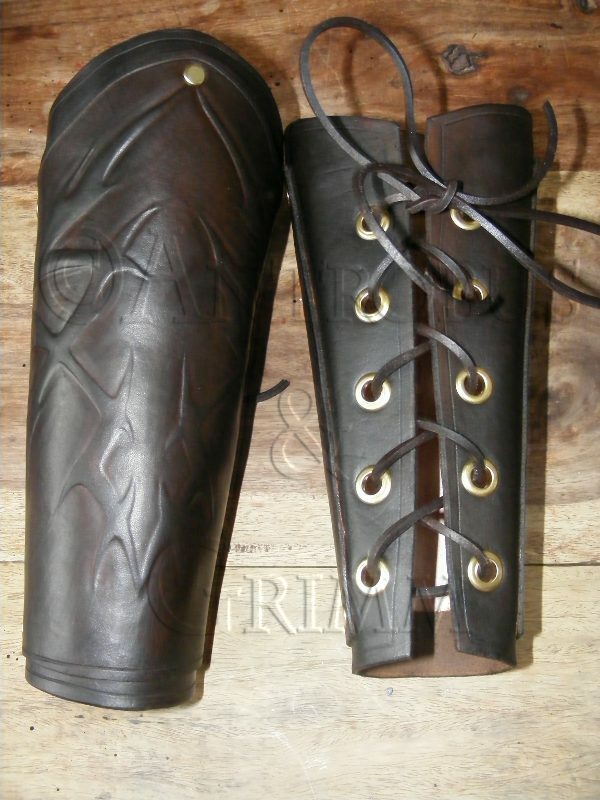 The armour is completed with a pair of leather bracers for the arms and greaves for the lower leg. Each of these is carefully molded before being adorned with further hand carved patterns to complete a stunning set of armour. To see further examples of our Bodywear please use the links below!